Travel with Kevin and Ruth! : We bought a kayak! So this one is also a blow up one, and originally quite a bit cheaper than the $400 or $500 ones but it has mostly decent reviews. On Amazon.com in the United States, I see great deals almost every day. In Canada however, at Amazon.ca, it is much more rare to find a truly great deal. So, how much did we pay for this kayak? $106 Canadian ($82 USD) with shipping and taxes included! And I don't know why, because it's not an advertised deal here in Canada. It's just marked down for some reason. And it still is. So, for our Canadian readers, here is a great deal for you! It's also on fairly cheap in the U.S., but not quite the deal that us Canadians get for a change! So, it supposed to arrive here in 7 to 10 days. Things are starting to quiet down here at the park so we should be able to use it on the lake before we leave. And, we'll have it with us to use on our trip back to Ottawa towards the end of next month. There are lots of lakes along the way! if it doesn't have a keel on the bottom you may be able to buy one that fits that model... you will need it! It does have a keel. Thanks, we think it was too! Guess we will find out how good once the kayak gets here. Looks like a beauty. Hope you enjoy many, many awesome adventures. Thank you Paul and Marsha, we hope to enjoy many wonderful adventures in it as well. Great buy! We absolutely love owning kayaks, definitely a purchase you won't regret. Being on the water is one of the very best ways to spot wildlife. So peaceful too. Sounds like great deal and I know you will have a lot of fun with it. Yep, I am sure we will have lots of fun with it! Hey, Kevin, how much does the kayak bundle weigh? It says that the shipping weight is 40 lbs. We have the Intex Explorer K2 & used it at Stone Island last winter. We were very pleased. Careful not to overfill the seats as they will split along the seam when installed and all the additional side pressure from the kayak. 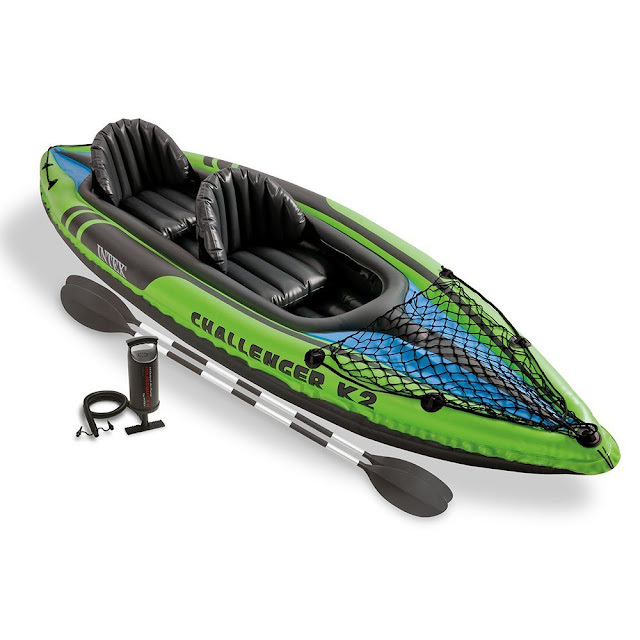 Intex is a great alternative to a regular kayak requiring less space. Thanks rocmoc! Looking forward to using it! Yep, that makes sense...thanks Mister Ed! Great find. There is no doubt that you will enjoy it.